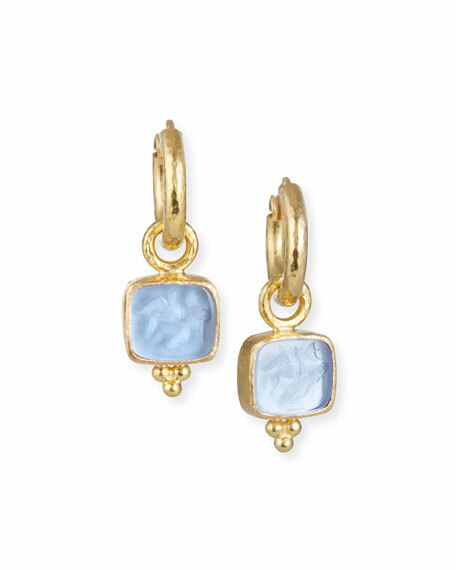 Venetian glass earring pendants modernize the time-honored intaglio tradition. Though intaglios historically have practical purpose as stamps or seals, these Elizabeth Locke earring pendants give your look an heirloom sensibility that's more fanciful than functional. Set of two charms; complete your look with a favorite pair of earrings in your collection. Cerulean Venetian glass square drop with Pegasus and goddess intaglio; mother-of-pearl backing.